Update: The site hosting the paper/graphics don't allow the graphs to be linked into another web page.... therefore if you want to the see the graphics - which I highly recommend - then click on the link below. Cancer rates are higher in developing nations. What really surprised me was that 56% of cancers and 64% of death due to cancer are in developing/emerging nations. If you think about this it is logical. These nations have vast slums or poverty areas which lead to poor diet or carcinogenic occupations such as recycling. Also it is due to the smoking that has very little regulation, hence high uptake in the developing world. Until I read the article I had somewhat naively seen cancer as a Western / Western diet problem. Although prostrate is the most common cancer in males it is only the 3rd largest killer behind lung and bowel cancers. 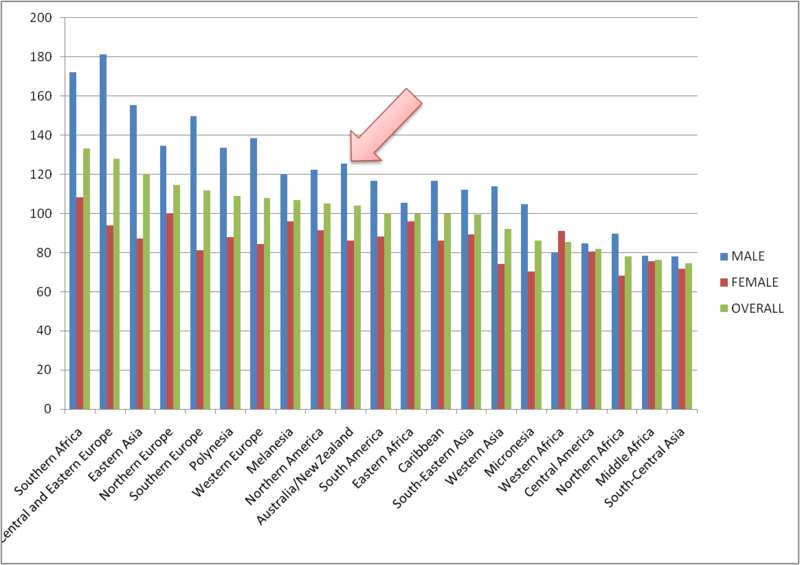 Disterbingly Australia/NZ has the highest rate of Bowel/Colorectal cancer, see the graph below. I will definitely now keep an eye out for information on this cancer! I don't even know what the signs are. No wonder my dad who like the classic male had bowel issues which is really uncommon for him, weighted a few days before going to the doctor. And like a lot of trips to the doctor it cleared the day he went! Anyway he got the "pleasure" [NOT] of having a colonoscopy. Good news is all is good. I couldn't figure out why the doctor took it so seriously. Now I know, I will tell Dad that his doctor is a good one ! Also NZ has a very high rate of breast cancer. I know most people have been touched by breast cancer, my grandma I never met died of breast cancer and our lovely "grandma" baby sitter last year had a mastectomy, so it is rather common. And we do pretty poorly with non-Hodgkin lymphoma, coming in 2nd in the world. Now again I have no idea what this is, let alone the symptoms. The lung cancer statistics are somewhat better with males being middle of the road. However females have the 3rd highest rate of lung cancer, so they are disproportionally higher risk. Good news we have low risk of stomach, liver, cervical (2nd lowest in world), esophageal and bladder cancer. Even though we have poor statistics for some cancers overall we do well. Below is a graph of death rates for male/female/average for various geographical regions. [note Y-axis is deaths per 100 000 population] NZ is highlighted by the arrow (clicking on graph will bring up bigger version). On the bright side Australia/NZ has one of the lowest cancer death rates in the developed world. Also note the massive difference between male and female cancer death rates. I suspect this is either due to (a) males reluctance to go to the doctor or (b) that males worked in more carcinogenic environments. It has only been in the few decades that all professions have opened up to females, thus cancer rates which might take decades to start changing haven't "kicked in" yet. If you are interested take a look online and have a read of the article.